"A lightly seasoned oil and lemon juice dressing perfectly accents the flavors of this salad made with barley, shrimp, and red and green bell peppers." Combine barley and water in a saucepan. Bring to a boil. Cover, reduce heat, and simmer for approximately 35 minutes. 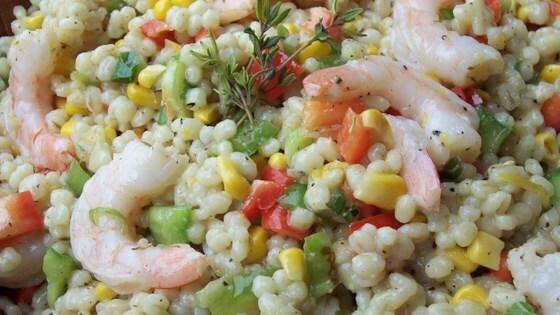 Transfer barley to a large bowl, and toss with shrimp, corn, bell peppers, green onions, thyme, and lemon zest. In a small bowl, whisk together lemon juice and oil. Season with salt and pepper. Pour dressing over barley salad, and toss to combine. Excellent! Very fresh tasting. I added lots of fresh parsley at the end and we all LOVED it here. My son and I are big shrimp fans and I'm always on the lookout for tasty recipes so thanks! There's too much carbo's in the receipe for Diabetics like me.